Tom Clancy was not supposed to be famous. Born in 1947, he grew up middle class in Baltimore and got an English degree from Loyola, where he joined the Army ROTC but was barred from military service because of his poor vision. After school, he got married and worked at an insurance agency that had been founded by his wifes grandfather, and that would have been enoughwould have been a fine life, indistinguishable from a million other livesexcept he decided to try his hand at writing novels in his spare time. He submitted his first manuscript to the Naval Institute Press, which probably seemed like a good fit given his storys military setting and its long stretches of dense technical descriptions. Editors persuaded him to cut a hundred pages of jargon, and that was that: released in 1984, The Hunt for Red October became a runaway hit, earning a jacket blurb from Ronald Reagan on its way to selling 45,000 copies in its first six months and more than 3 million by the time of Clancys death in 2013. His name became a brand for a certain kind of storymilitary espionage potboiler, with an emphasis on technological accuracy and a penchant for verisimilitudeand by the end of his life, his net worth was pegged at $300 million. You do not get to make that kind of money without Hollywood noticing, and sure enough, the entertainment industry came calling not long after The Hunt for Red October made Clancys name a household one. The film rights were optioned in 1985, and the movie made its way to theaters in 1990. (Clancy wasnt a fan of this or any of the movies made from his books.) This was the start of a film franchise that would continue with adaptations of additional Clancy books, in 1992s Patriot Games and 1994s Clear and Present Danger, at which point it essentially ended. Two attempts to reboot the series2002s The Sum of All Fears and 2014s Jack Ryan: Shadow Recruitflamed out for various reasons, but those later films are also easy to ignore because they took place in different fictional universes, severed from the continuity and consequences of the earlier installments. The first three films made from Clancy books form a trilogy that revolve around the travails of Jack Ryan, a CIA analyst who finds himself drawn into increasingly dangerous situations (politically and physically) in the field, but theyre also much more. Theyre fascinating aesthetic and political documents, charting Americas (and Hollywoods) transition from the Cold War years into the morass of the war on terror. Clancys work came to be emblematic of a certain kind of Boomer mentality: militaristic but wary of the system, interventionist but iffy on the outcome. His breakthrough novel and subsequent successes mined the Cold War for story and emotion, but the Soviet Union disbanded not long after his career got started, leaving a vacuum into which no other clear villain could ever successfully be placed. To watch the films now, more than twenty years after the last installment, is to skip like a stone across the surface of the cultural paranoia that rippled in the wake of perestroika. Theyre metaphors for themselves in many regards, and viewed through the right lens, they cohere into a single image of what it was like to live through the time of their making. The first film is, inarguably, the best. 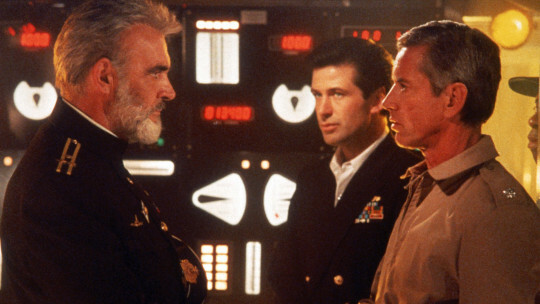 Released in March 1990, The Hunt for Red October is a taut chase movie and stellar action film that never sacrifices intelligence for excitement. Alec Baldwin stars as Jack Ryan, a CIA analyst recruited to suss out the truth behind a special kind of Soviet submarine with silent-propulsion technology. The submarine in question is the Red October, piloted by Captain Marko Ramius (Sean Connery), who, disillusioned with the Soviet navy, plans to defect to the United States with a few loyal officers. His Soviet commanders, learning of this, not only begin chasing Ramius, but also tell the American National Security Adviser that Ramius plans to launch nuclear warheads into the States, thereby roping their adversaries into the hunt. Ryan is the only one who suspects Ramius true plan, so he sets out to intercept him before anybody else can. Theres a beautiful simplicity in that structure, as every scene and subplot are tied to the central question: who will catch the sub? John McTiernans skill as a director of movies like this cant be overstatedprior to this hed helmed Predator and Die Hard, refining the rulebook on 1980s Hollywood action filmmakingbut he also moves effortlessly between sharply choreographed, fantastically directed action sequences and equally effective moments of character development and contemplation. There are assured, believable performances here, including Baldwins affable Jack Ryan, whos scrambling to keep up with the situation at hand; Scott Glenns Bart Mancuso, the commander of a U.S. sub thats pursuing Ramius; James Earl Joness Admiral Greer, the wise mentor who brings Jack into the situation; and Sam Neills Vasily Borodin, the second-in-command on the Red October who just wants to escape to a peaceful life in America. Adapted by Larry Ferguson and Donald Stewart, the screenplay strips the story to its essence, blending sociopolitical brinksmanship with thriller tropes in a way thats consistently entertaining, even today. It was also a financial success, meaning a sequel was inevitable. Tom Clancy was not supposed to be famous. Born in 1947, he grew up middle class in Baltimore and got an English degree from Loyola, where he joined the Army ROTC but was barred from military service because of his poor vision. After school, he got married and worked at an insurance agency that had been founded by his wife’s grandfather, and that would have been enough—would have been a fine life, indistinguishable from a million other lives—except he decided to try his hand at writing novels in his spare time. He submitted his first manuscript to the Naval Institute Press, which probably seemed like a good fit given his story’s military setting and its long stretches of dense technical descriptions. Editors persuaded him to cut a hundred pages of jargon, and that was that: released in 1984, The Hunt for Red October became a runaway hit, earning a jacket blurb from Ronald Reagan on its way to selling 45,000 copies in its first six months and more than 3 million by the time of Clancy’s death in 2013. His name became a brand for a certain kind of story—military espionage potboiler, with an emphasis on technological accuracy and a penchant for verisimilitude—and by the end of his life, his net worth was pegged at $300 million. You do not get to make that kind of money without Hollywood noticing, and sure enough, the entertainment industry came calling not long after The Hunt for Red October made Clancy’s name a household one. The film rights were optioned in 1985, and the movie made its way to theaters in 1990. (Clancy wasn’t a fan of this or any of the movies made from his books.) This was the start of a film franchise that would continue with adaptations of additional Clancy books, in 1992’s Patriot Games and 1994’s Clear and Present Danger, at which point it essentially ended. Two attempts to reboot the series—2002’s The Sum of All Fears and 2014’s Jack Ryan: Shadow Recruit—flamed out for various reasons, but those later films are also easy to ignore because they took place in different fictional universes, severed from the continuity and consequences of the earlier installments. The first three films made from Clancy books form a trilogy that revolve around the travails of Jack Ryan, a CIA analyst who finds himself drawn into increasingly dangerous situations (politically and physically) in the field, but they’re also much more. They’re fascinating aesthetic and political documents, charting America’s (and Hollywood’s) transition from the Cold War years into the morass of the war on terror. Clancy’s work came to be emblematic of a certain kind of Boomer mentality: militaristic but wary of the system, interventionist but iffy on the outcome. His breakthrough novel and subsequent successes mined the Cold War for story and emotion, but the Soviet Union disbanded not long after his career got started, leaving a vacuum into which no other clear villain could ever successfully be placed. To watch the films now, more than twenty years after the last installment, is to skip like a stone across the surface of the cultural paranoia that rippled in the wake of perestroika. They’re metaphors for themselves in many regards, and viewed through the right lens, they cohere into a single image of what it was like to live through the time of their making. The first film is, inarguably, the best. Released in March 1990, The Hunt for Red October is a taut chase movie and stellar action film that never sacrifices intelligence for excitement. Alec Baldwin stars as Jack Ryan, a CIA analyst recruited to suss out the truth behind a special kind of Soviet submarine with silent-propulsion technology. The submarine in question is the Red October, piloted by Captain Marko Ramius (Sean Connery), who, disillusioned with the Soviet navy, plans to defect to the United States with a few loyal officers. His Soviet commanders, learning of this, not only begin chasing Ramius, but also tell the American National Security Adviser that Ramius plans to launch nuclear warheads into the States, thereby roping their adversaries into the hunt. Ryan is the only one who suspects Ramius’ true plan, so he sets out to intercept him before anybody else can. There’s a beautiful simplicity in that structure, as every scene and subplot are tied to the central question: who will catch the sub? John McTiernan’s skill as a director of movies like this can’t be overstated—prior to this he’d helmed Predator and Die Hard, refining the rulebook on 1980s Hollywood action filmmaking—but he also moves effortlessly between sharply choreographed, fantastically directed action sequences and equally effective moments of character development and contemplation. There are assured, believable performances here, including Baldwin’s affable Jack Ryan, who’s scrambling to keep up with the situation at hand; Scott Glenn’s Bart Mancuso, the commander of a U.S. sub that’s pursuing Ramius; James Earl Jones’s Admiral Greer, the wise mentor who brings Jack into the situation; and Sam Neill’s Vasily Borodin, the second-in-command on the Red October who just wants to escape to a peaceful life in America. Adapted by Larry Ferguson and Donald Stewart, the screenplay strips the story to its essence, blending sociopolitical brinksmanship with thriller tropes in a way that’s consistently entertaining, even today. It was also a financial success, meaning a sequel was inevitable.